Meet Ariel Swedroe Weinberg. At 11 years old, she is already well on her way to become one of this country’s major fashion designers. She has been designing for three years. I met her at Art Basel in Miami. She was there to debut her new line mermaid dresses. While Art Basel is really all about paintings and photography, Ariel felt it was a great stage for exposure. Ariel and her entourage of models were walking around the show to garner attention for the brand, Swedroe. 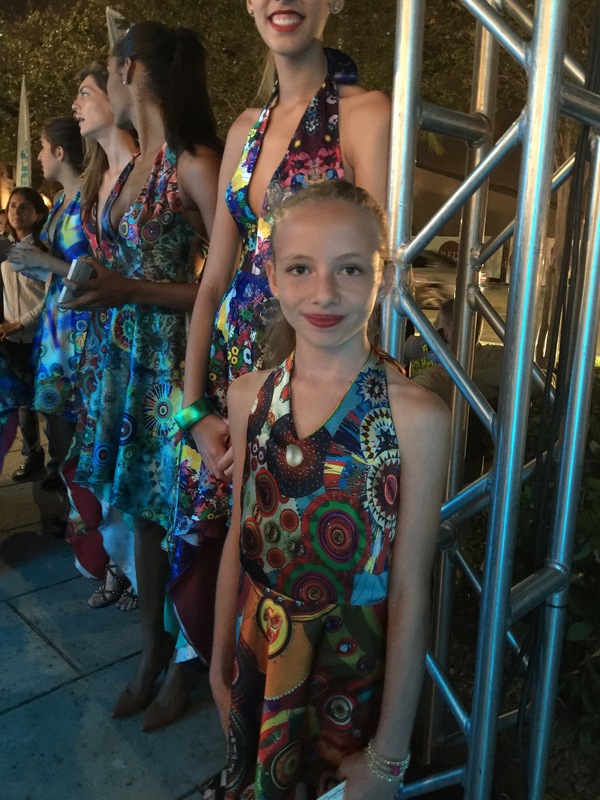 Ariel was already featured in the Miami Herald because she designed a collection for a local tech show. Ariel participates in Design Lab Miami, a dedicated sewing center with classes for kids and adults. If you watch the above video, the five minute clip will explain in detail how she got her start and some of her past work. Ariel’s inspiration comes from her grandfather, Robert Swedroe, a well-known artist and architect in the Miami area. In fact, her grandfather’s art is laser printed on her fabrics. She loves the vibrancy of his colors. Ariel also features LED lights on some of her designs so that she can mix technology with fashion. The hot topic in tech today is wearables like a digital pedometer that you wear on your wrist or Google glasses. Ariel is right in the middle of this developing trend. Remember her name. She is going to be the next Versace or Vera Wang, or somewhere between.